"On My Way Home" is a song by Irish new-age artist Enya. It was released as the second and final single from her fourth studio album, The Memory Of Trees. 4.- Banjodoline VSTi is a Virtual Banjo and Mandolin sample-based software, including a Banjolin, Octave Mandolin and Electric Mandolin fretted stringed instruments. 5.- Realistic Virtual Piano is an acoustic grand piano emulation with a breathtakingly rich and realistic sound. Particular care has been taken in the reproduction of the original realism and touch response of a Kawai and Yamaha Grand Pianos. 6.- Percussion Kit is a collection of percussion instruments designed for creating Orchestral Percussion, Auxiliary Percussion, Mallet Percussion, Latin Percussion, Indian Percussion and African Percussion. 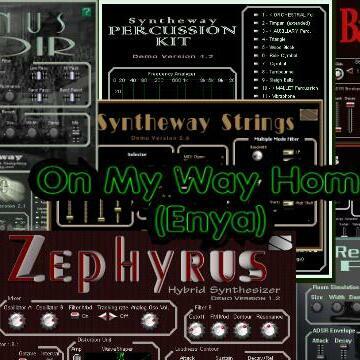 7.- Zephyrus VSTi is a hybrid synthesizer that combines an analog synthesis engine and SoundFont oscillator to produce complex pads and background sounds. 8.- Organux is a virtual organ VST plug-in designed for creating a wide range of classic and modern organ sounds.